Gregorian Chant CD: Now on Sale! 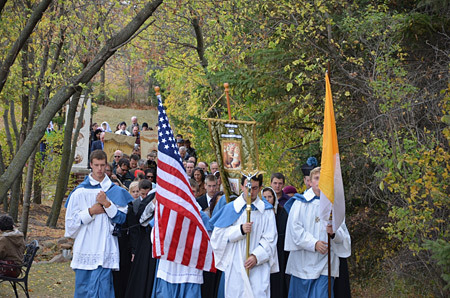 For the second consecutive year, the canons and faithful of the Institute in the American Midwest made their pilgrimage to the Shrine of Our Lady of Good Help in Robinsonville, near Green Bay, Wisconsin. The apparition of Our Lady to Adele Brise on October 9, 1859, is the first Marian apparition in the United States to receive diocesan approval. It followed close upon the dedication of the United States to the Immaculate Conception in 1847, the proclamation of that dogma in 1854, and the Marian apparitions at Lourdes in 1858. The Queen of Heaven asked Sister Adele to pray and offer sacrifices for the conversion of sinners and to teach the catechism to the children of the region. Our Lady promised her help in this mission. Now more than ever, we should not hesitate to fly to Our Lady of Good Help to beg her assistance in educating the youth and building a true Catholic culture. The Institute's pilgrimage included a Rosary procession on the beautiful grounds of the Shrine, Solemn High Mass in the chapel, an enjoyable picnic lunch and Solemn Benediction to close the grace filled day. Holy Mass was celebrated by Canon Benoit Jayr, Rector of St. Stanislaus Oratory in Milwaukee. Assisting as Deacon and Subdeacon respectively were Canon Andreas Hellmann, Rector of St. Joseph's Oratory in Green Bay, and Canon Aaron Huberfeld, Rector of St. Mary's Oratory in Wausau, Wisconsin. Copyright © MMXVI Institute of Christ the King. All rights reserved.